Ministry Consultant Rev. 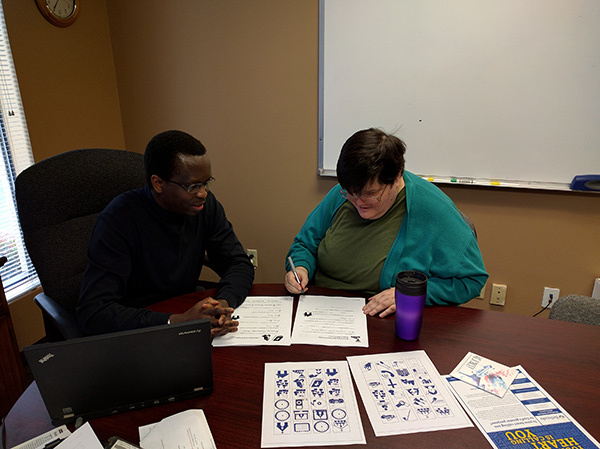 Philemon Ngare helps a person we support complete Bethesda's Faith in Action workbook. Bethesda Lutheran Communities desires to enhance the lives of people with intellectual and developmental disabilities with services that share the Good News of Jesus Christ. Operating at program locations across the United States, they provide homes and support, promoting awareness and advocating for people with intellectual and developmental disabilities. Over 1,900 people at 300 program sites in 13 states are served. Travel is essential in achieving this mission. Costs are not subject to state reimbursement when faith supports are at the heart of the mission. Relying on the support of donors, Bethesda is able to nourish relationships and grow their network to support people of all abilities with their faith journey. Grant funds would be used to support ministry consultant travel. Learn more about this mission grant and view more photos here.